RALEIGH, N.C. (AP) — Kansas coach Bill Self sees big holes when he looks at his roster after losing three starters, including Associated Press All-American Devonte’ Graham. The voters in the AP Top 25 poll see something different: a roster restocked so well that Jayhawks will start the season as the nation’s top team. “Obviously we lost a lot off last year’s team with Devonte’, Svi (Mykhailiuk) and Malik (Newman), so I’m a little surprised that the writers put us there this preseason,” Self said in a statement to the AP. “It’s definitely a spot we welcome and certainly know the goal is to be playing to that ranking by when it counts the most. 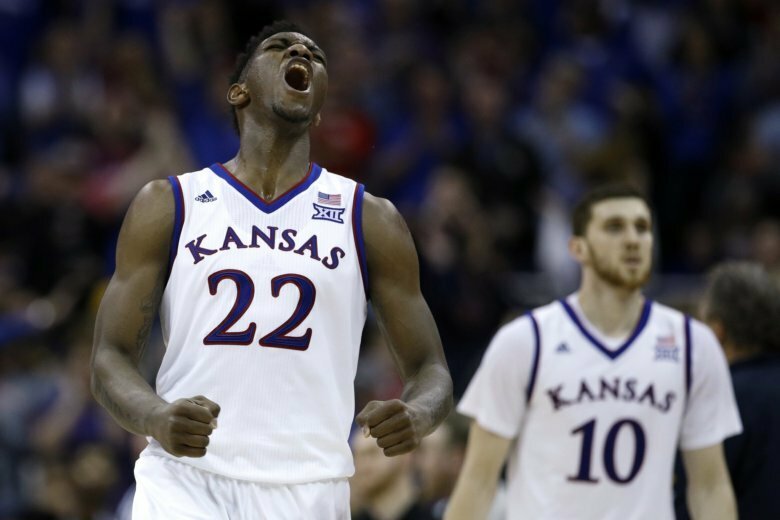 The Jayhawks return veteran starters in junior 7-footer Udoka Azubuike and senior Lagerald Vick from a team that reached its first Final Four since 2012. They’re also adding transfer help from Memphis twins Dedric and K.J. Lawson as well as California’s Charlie Moore — all double-digit scorers on their previous teams. And yet, the previous two times the Jayhawks started at No. 1 didn’t end well. The 2004-05 squad lost to Bucknell in the first round of the NCAA Tournament. And the 2009-10 team that held the top spot for 15 of 19 weeks overall and won 33 games lost to Northern Iowa in the second round. The ranking comes as the program finds itself entangled in the federal corruption case tied to payments used to steer recruits to certain schools. Testimony during the recent first trials included references to Self and sophomore forward Silvio De Sousa , though Self isn’t charged with wrongdoing and it’s unclear if De Sousa’s status will be affected. John Calipari’s latest group of touted recruits helped the Wildcats earn 19 first-place votes to open as a top-5 team for the eighth straight season. Gonzaga’s ranking is the program’s highest in a preseason AP poll, though the Zags have reached No. 1 during the regular season before. As for Duke, the Blue Devils had started No. 1 in each of the past two preseason AP polls. The points gap between the Jayhawks and the Blue Devils (129 points) at fourth was slimmer than between Duke and fellow Atlantic Coast Conference program Virginia (166 points) at No. 5. Speaking of Tony Bennett’s Cavaliers, one of the biggest things to watch will be how well the Virginia responds to the most historic of tournament losses. The Cavaliers ended the regular season as the unanimous AP No. 1-ranked team and the No. 1 overall NCAA Tournament seed, yet somehow became the first 1-seed to lose to a No. 16 against UMBC. Bennett said all the right things about learning from that moment. And his team returns Kyle Guy (14.1 points), Ty Jerome (10.6 points) and its best NBA prospect in sophomore De’Andre Hunter. Virginia has its highest preseason AP ranking since Ralph Sampson’s final team opened at No. 1 in 1982-83. The Martin twins are back along with Jordan Caroline, and that has Nevada starting the year with the program’s highest ever AP poll ranking at No. 7 after last year’s NCAA Sweet 16 run . No Jalen Brunson, no Mikal Bridges, no Final Four most outstanding player Donte DiVincenzo. And yet reigning national champion Villanova checks in at No. 9. The Wildcats still have Eric Paschall and Phil Booth back while adding Albany graduate transfer Joe Cremo. There’s also a bit of respect built into this ranking, both for the stature of program Jay Wright has developed (two national championships in three seasons) and for the Wildcats’ dominating romp through the postseason. The Southeastern Conference was next up with five teams: Kentucky, No. 6 Tennessee, No. 11 Auburn (the program’s highest ranking since 2000), No. 18 Mississippi State and No. 23 LSU. Hello again to Porter Moser, Sister Jean and Loyola (Chicago), last year’s Final Four surprise . The Ramblers were only three points behind No. 25 Washington, putting them just outside the poll. Marquette was next with high-scoring junior Markus Howard back, while Archie Miller’s second year at Indiana has the Hoosiers lurking nearby as well. Several power-conference teams like Florida, Nebraska, Maryland and Wisconsin could find their way into the poll with a few early wins.